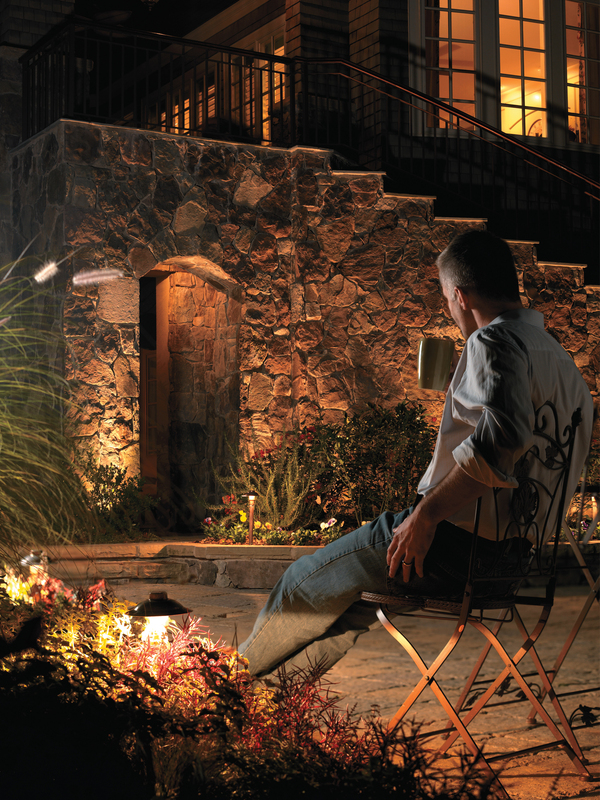 Deck and patio lighting will give your backyard a whole new look. Your deck and patio are the single most used areas of your home from the onset of spring well into the fall. If you find yourself letting darkness elude your outdoor enjoyment by forcing you inside with the setting sun, we have just the recipe to perk up your patio or make using your deck in the evening more desirable; our deck and patio lighting designs. When you take into consideration all the elements that make you deck a functional area such as adequate seating areas, landscape surround and a grill or even outdoor kitchens, outdoor lighting for your deck is just as important. A deck without any of these elements in essence is just a boring and dull appendage with no character or function. This deck and surrounding area sets the mood for many glorious entertaining possibilities with the wonderful deck lighting is now has. 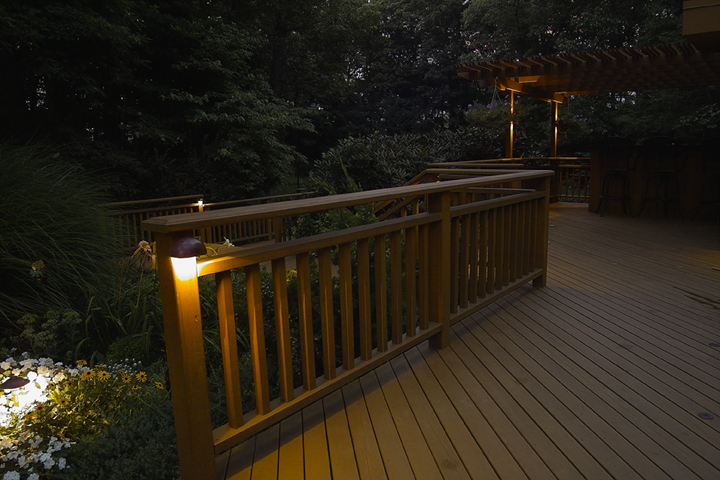 Our deck and patio lighting provides added security for more visibility, mobility and footing on your deck while in use. It also provides the opportunity for extended hours of enjoyment on your deck. Lighting your deck can also promote ambiance and character in your outdoor living space as well. We use the appropriate light fixture for each installation to deliver all of these luxuries to you as part of the whole package. Our copper and brass deck mounted half-moon sconce lights are perfect to place on the hard to light area. We generally install these on the deck posts of your decks railing. These lights are elegant and made of the finest materials which are built to stand the test of time, understated yet powerful in that they cast the industry’s widest indirect wash of light. They also work great installed in retaining walls or other areas of your deck or patio. We have even installed them underneath the built-in bench seating of decks for a dazzling, unique effect. Since these lights are made of copper and brass they weather to a beautiful patina with age. 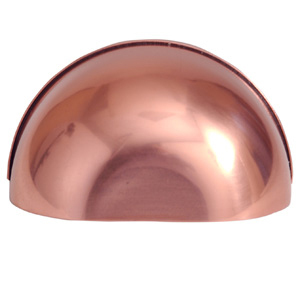 Another favorite in our deck and patio lighting installations is the classic adjustable pier mounted copper path light. It works wonders when secured atop retaining walls, along deck and placed around the landscaping that surrounds your deck. With a high quality of light that casts a widespread glow that makes it a solid choice for the areas that need extended visibility. 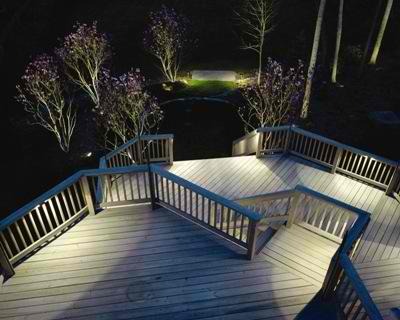 Can you imagine the entertaining and family time opportunities that having a well-lit deck would open up? No more stumbling or trying to grill by the light of a single builder-grade security light, trying to decide if the steak is rare or well-done. No more having to move your guests inside with the setting sun because of the lack of visibility. Deck lighting seems simple enough, but it opens up a whole new realm of outdoor living opportunities you never thought possible. It can even improve the way in which you view your entire backyard. Soft washes of light will create an ethereal effect on every area that surrounds the deck, from the stone used in a retaining wall to the delicate blooms of flowering shrubs that are located in your decks landscape border. The possibilities are endless. Contact Outdoor Lighting Perspectives of Nashville to learn more about our deck and patio lighting designs. We can even schedule a night-time demonstration and give you a taste of what you have been missing. For more deck and patio lighting designs to spark your inspiration; visit our deck and patio lighting gallery located on our website. This entry was posted in Deck lighting, Our high quality lighting fixtures, Patio lighting and tagged Deck and patio lighting fixtures, Nashville deck and patio lighting, Nashville deck lighting, Nashville deck lighting specialists, nashville patio lighting, Nashville patio lighting specialists by outdoorlightingnashville. Bookmark the permalink.